Lebbeus Woods, internationally renowned architect, artist and Cooper Union faculty member, died on October 30 leaving behind saddened colleagues and students as well as a remarkable body of work that challenged its audience while always projecting a formal beauty. 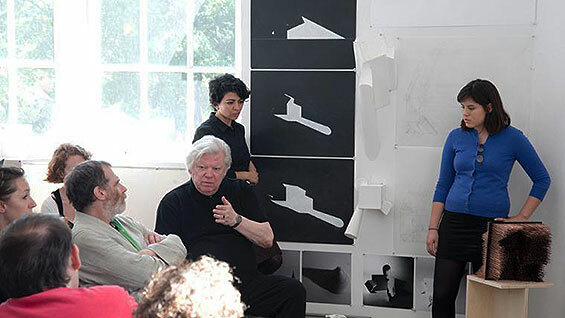 Woods, who taught at The Irwin S. Chanin School of Architecture from 1987 through 1996, and again starting in 2001, last met students for their mid-term critique of an Architectonics class just days before his death. “[We] mourn the loss of a great teacher, a great and ethical artist, a visionary architect and dear friend to The Cooper Union across four decades,” began a letter to the Cooper community co-signed by President Bharucha, Dean Anthony Vidler and Associate Dean Elizabeth O’Donnell. Lebbeus Woods also embraced the web, creating both a personal site as well as a blog. The web, in turn, embraced him with sites both national and international creating memorials of him and his work, including the Los Angeles Times, U.K.’s The Guardian and architectural blog BLDGBLOG.